Since 2000, nineteen hospitals have closed across New York City and protesters are now fighting to stop the twentieth closure. For many New Yorkers, the trip to treat a broken appendage or receive vaccination shots is growing longer. Since 2000, nineteen hospitals across the city have closed due to financial pressures—a number that could have even been higher had a judge not recently ordered Long Island College Hospital (LICH) in Brooklyn to resume services. Nurses gathered outside LICH in early July to deliver a nearly 7,000-signature petition to SUNY Downstate Chancellor Nancy Zimpher’s New York City office demanding she stop the process of closing the hospital. Journalist Sarah Jaffe reported that after a SUNY representative refused to comment on the ongoing situation, the crowd turned to civil disobedience and blocked the doors to the building and refused to move until police took them away in cuffs. Though those protesters were successful in fighting for the return of emergency services, the twentieth closure may occur soon if plans to shut down Interfaith Medical Center in Brooklyn go through. Community members held an all-night vigil Sunday to protest the planned closure. Thus far, Governor Andrew Cuomo has not expressed sympathy for hospital staffs and residents losing easily accessible medical care, and has said he is unwilling to bail out failing hospitals. “If you look closely and follow the proper guidelines, money is available for safety-net hospitals,” District Leader for the 56th Assembly district Robert Cornegy said. “Safety net hospitals” is how advocates describe facilities in low-income areas that provide much needed services. They say the government has a moral obligation to care for the sick and the poor. For many residents, the walk from their apartment to the nearest hospital has increased from a few blocks to, in some cases, a few miles. Advocates say that change is a matter of life and death, especially for the city’s poor residents. Bedford-Stuyvesant resident Stephen Autry told an ABC affiliate that the nearest hospital to his home is in Woodhull on Flushing Avenue, and that is several miles away. Kaiser Health News notes that most of the hospital closings have occurred in relatively poor communities, while a handful were in affluent areas but served as “safety-net” facilities, because local residents who were wealthy and insured favored other facilities farther away. New York applied to the federal government a year ago for a Medicaid waiver that officials hoped would net the state $10 billion through better care management, some of which going towards bolstering and modernizing Brooklyn’s healthcare system. But almost a year later, Albany has received no money from Washington. In May, Governor Cuomo went so far as to send a plea to Health and Human Services Secretary Kathleen Sebelius. Sager notes that the decline in hospital beds comes at a time when the baby boomer generation has begun to age, and will most likely need hospital care. 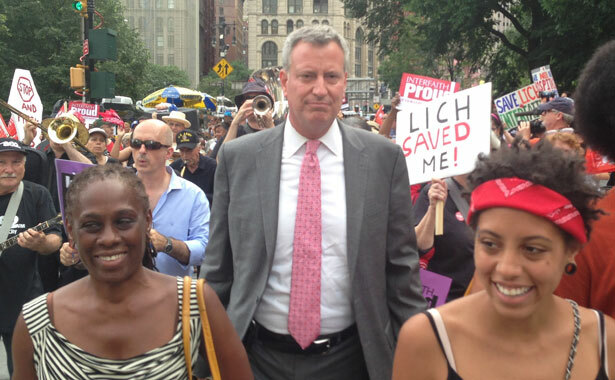 Mayoral candidate Bill de Blasio has addressed the problem of dying community hospitals and was one of the arrestees last month at the LICH protest. His office sued to block the shutdown, arguing that it lacked proper review and would rob the community of needed services. A New York Times editorial this week said that while Mayor Bloomberg has waged war against sugary soda drinks and trans fats, he has “checked out” when it comes to the issue of community hospitals closing. “Struggling community hospitals, including the two on the brink of extinction—Long Island College Hospital and Interfaith Medical Center in Bedford-Stuyvesant, which is in bankruptcy court—have been badly managed and are ill equipped to survive in a changing marketplace. Many are disappearing under mountains of debt and need to be either rescued or reinvented,” said the Times. De Blasio is proposing to rescue the hospitals through a new entity, a Brooklyn Health Authority, run jointly by the city and state, with the power to modernize hospital systems borough-wide, coordinate the spending of healthcare dollars and set higher standards of care. A report released by de Blasio warns of “devastating consequences” if Interfaith Medical Center closes next month. Interfaith is Brooklyn’s largest private provider of psychiatric care, with 67,000 patients receiving out-patient care and 1,750 in-patient hospitalizations each year. According to de Blasio’s report, “Tearing the Safety Net,” losing those services would push remaining hospitals across Brooklyn to 107 percent capacity, and leave tens of thousands of Brooklyn psychiatric patients without care. The Brooklyn Daily Eagle reports that Interfaith has already sent layoff notices to its 1,544 employees. The hospital declared bankruptcy in December and announced August 1 that it was beginning the process of shutting down. Why is the AFL-CIO exploring new investments in alt-labor?